Opera Software has just released the final version of Opera 11.51 after two release candidates that have been released in the past week. The new version of the web browser fixes several stability issues which makes it more of a maintenance release than a release that comes along with new major features. Still, Mac users that run the Mac Os 10.7 Lion operating system get support for the new full screen application mode introduced in the OS by Apple. The changelog lists several crash and stability related fixes. This includes a fix that drops the cpu utilization of Opera's extension manager and several Speed Dial related crashes on some user systems. The new version furthermore fixes several usability issues, like toolbar buttons that were no longer showing up in Opera's user interface. Opera 11.51 fixes two security issues. First an issue "that could allow unsecured web content to appear secure" and second an undisclosed low severity issue. 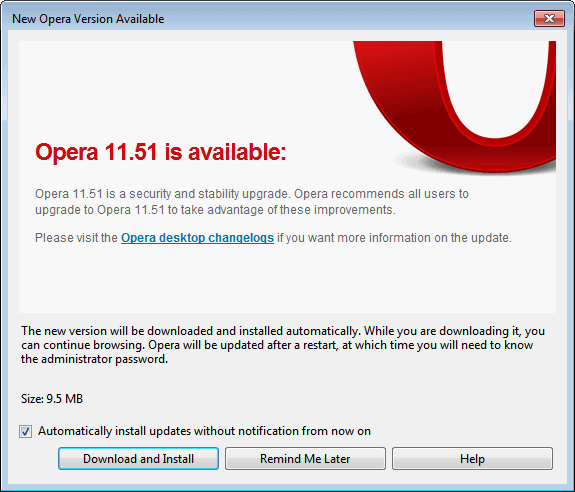 The new version of the Opera web browser is already available via the browser's internal updating mechanism. Users can check for new updates via Opera > Help > Check for Updates. The browser should however pick up the new version automatically by the time of writing. New users and users who do not want to update the browser via its updating tool can download the latest version from the official Opera website. The next release as it stands now will be Opera 12.00, a new version that is likely to ship with new features and improvements. This includes speed improvements and better network latency. Opera confirmed that users might see page loading in half the time as before, especially on poor network connections or when connecting to web servers hosted on a different continent. It was not my intention to link to the latest snapshot, but to a post that has the details of what users can expect in Opera 12. I’m all for Opera v.12 – Wahoo, really excited how it measure against Chrome primarily in terms of speed and other features as well, maybe hardware acceleration will supported in this version. Nevertheless I await patiently for its final release, not really in mood to test the released beat snapshots. I am happy to use opera.